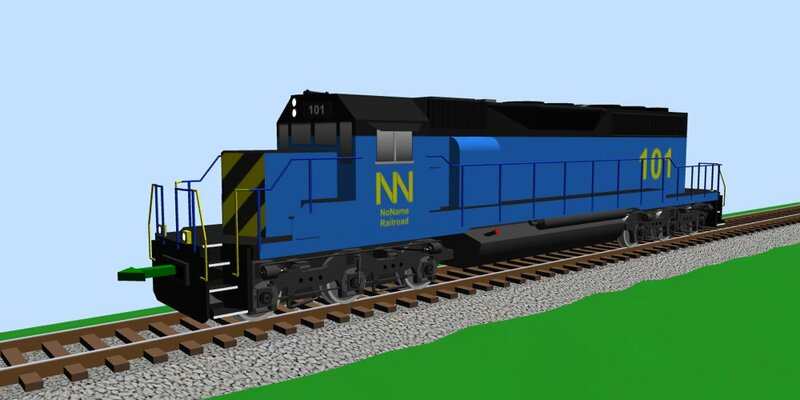 6-axle diesel engine model SD40-2 of NoName Railroad company (fictional railroad company in the United States), in blue livery with black top and yellow markings. The SD40-2 is a 3000-horsepower (2200 kW), C-C wheel arrangement, diesel-electric locomotive, designed and built by EMD from 1972 to 1989. The good reliability and versatility of this locomotive made it the best-selling model in EMD's history and the standard of the industry for several decades after its introduction. The SD40-2 is used mainly in United States, Canada, Mexico, Brazil and Guinea with export modifications for Great Britain, former Yugoslavia, South Korea, Iran, Morocco, Peru, Pakistan and other countries. Even now, nearly all built locomotives still remain in service. The virtual model for SCARM MTS is based on mixture of details, taken from the prototype drawings and real scaled model in HO (1/87) scale, produced by Bachmann. All major dimensions are preserved and most notable details are represented in the virtual model.